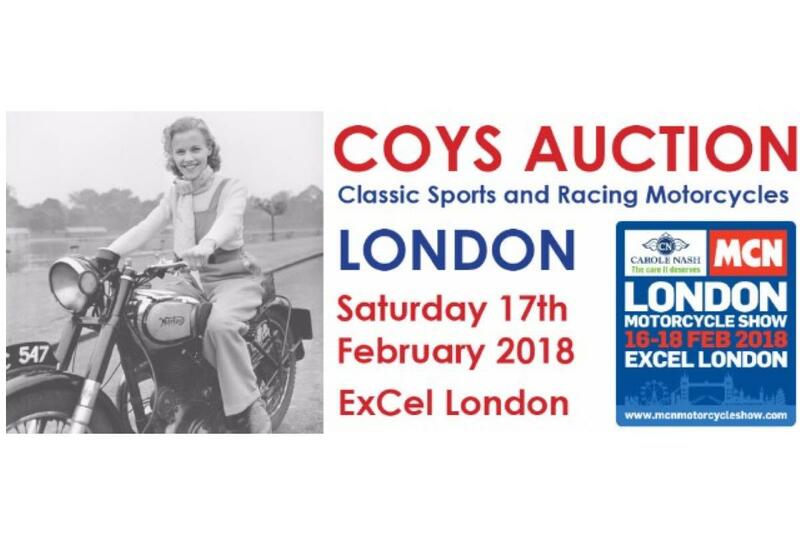 Coys of Kensington will once again be holding an auction at the 2018 Carole Nash MCN London Motorcycle Show, featuring an enticing range of bikes for every pocket, this weekend. Last year’s auction saw an incredibly diverse range of machines on offer with everything from flat-tank pioneer bikes to modern day race machinery up for grabs. Highlights of the sale included a 1927 Brough Superior Overhead Valve 680 that went under the hammer for a blistering £78,400 and an ‘as-new’ 1994 Honda RC45 with just 1km on the clock that sold for £40,320. Due to the success of the 2017 event, entries for 2018 will be strictly limited but there is still time to submit a machine for sale in the auction. The auction will be held in the main hall at ExCeL on Saturday February 17. Brad Pitt's customised Triumph Bonneville is already confirmed for the 2018 auction. Send entries to Dan Godin at Coys UK motorcycle department on 0208614 7888, motorcycle@coys.co.uk or Giuliano Fazi +39 335 1488303, giuliano.fazi@coys.co.uk at Coys European office.